How much does it cost to….. This is a very common question, but not one that we can effectively answer here. We do have some services that are “all encompassing” and have a set price for all things included, like routine spays and neuters, but many procedures require multifaceted estimates to be given only after an animal has been properly evaluated and a treatment plan can be made. Some prices change based on current supply and equipment costs, drugs costs, etc. We ask that if you have a question regarding current prices, please contact us directly via one of the communication lines available (phone, email, or pet desk app). If an exam or more thorough discussion regarding the pet is needed to determine cost, an appointment will likely be required. We try to keep client prices down below standard in the areas of routine spays and neuters, rabies vaccinations, and heart worm, flea and tick prevention, specifically to keep those items as accessible to the community as possible. Please keep in mind, we do not receive grants or donations to provide a true “low cost” spay or neuter service with free vaccinations included. Can I get answers to pet question via social media or email? Sometimes you just want a quick answer to a pet question. In today’s highly connected world its common to ask questions and get quick answers over all kinds of formats: Facebook, Twitter, Email, etc. For the purpose of client confidentiality we don’t discuss detailed pet questions over social media. We also don’t have the doctors themselves monitoring the social media accounts all the time. Are you kidding? All the kitten and puppy photos on Facebook? They’d never get any work done! If you have a pet question but its not convenient for you to call, or maybe you think of it after hours, you can email your question to our staff. The receptionists will route the email to the appropriate doctor (during business hours) and they’ll get back with you via email or phone, depending on your preference. The Patient’s Name, Species, date of birth, breed, age, and weight – or as much of this as you know. What problem your pet is experiencing, how long it’s been going on, anything you think might have caused it. If it’s a general question – such as what type of food might be best for XYZ condition, this information is still valuable. How to get back in touch with you – feel free to include call-back times if you aren’t available during the day. You laugh… but we get those emails. They DO happen! That kind of email tells our doctors a lot more. They know who you are, who the pet is, what breed and age they are, and they can start looking up your furry companion in our database and get some facts together even before they get you on the phone. It makes diagnosis quicker and saves both you, us, and your pet a lot of time spent going over information. Feel free to email us anytime, day or night, at vet@bearcreekvet.net with your pet questions. Remember: Never email about a suspected emergency situation. Our emails aren’t monitored 24 hours a day, but our phones are! Always call if it’s something you’re concerned enough about that you feel sure you need an immediate answer. Just to be sure you’re never charged for something you might have decided you don’t need anymore, you will always get an email one week in advance to remind you of the upcoming autoshipment. This will give you time to modify your order, cancel it, or just do nothing and your package will arrive as scheduled. The difference between an one-time order and an autoship order is simply option you press when you add it to your cart. If you want to purchase the item one time, press Add to Cart. If you want to have it autoshipped on a schedule, click Autoship and the website will walk you through the process of setting up a shipping schedule before you check out. How long does it take to receive deliveries? Shipping times are dependent on the item you order. Many items, such as things that are temperature-sensitive, will ship UPS overnight. Larger things, such as foods, normally ship UPS ground, so assume 5-9 business days depending on UPS. AutoShip items and Remind-Me Items: always ship standard UPS ground, so expect them to arrive 5-9 days from the date you purchase. Free Shipping items: always ship Standard, so expect 5-9 days. Other Items: Can qualify for free shipping, or if you want them quicker, you can request 3-day, 2-day, or even next business day shipping. For rates and times see the Shipping Cost article above in the FAQ. What is the Home Delivery Return Policy? All returns have to be pre-approved by Vets First Choice, (not the staff at Bear Creek). To get approval for a return, and return-shipping information, please contact Vets First Choice at 888-806-3336 to facilitate the credit to your account. Our pet food return policy is pretty awesome! If, for any reason, your pet doesn’t like the food, or it doesn’t sit well with them, or it arrived in poor condition, etc… whatever the reason, Vets First Choice will gladly facilitate a credit for your purchase. They will not ever ask you to return the unused food. Shipping food is too much of a financial burden on the customer. All we ask is, as long as there’s nothing physically wrong with the food itself, that you either donate it to an animal shelter, animal rescue, or you can even donate it to the clinic. We have many animals in and out all the time and sometimes they’re picky. We’ll try not to let it go to waste! To facilitate a credit on nutrition items, please contact Vets First Choice at 888-806-3336. Their friendly staff will walk you through the process. Prescription items are the one area we can’t take returns on. It’s a federal law and NO ONE can accept returns on prescription medication, whether it’s for humans or animals. It’s just against the law everywhere, whether it’s unopened and still sealed in the package or not. What does it cost to ship? Shipping rates are determined by our partner and supplier, Vets First Choice, but we can give you the broad overview here. All Hills, Royal Canin, and Purina foods found in our home delivery section have free shipping, no matter how much or how little you’re ordering as long as it’s on autoship. One time shipments have a $14.95 shipping rate. If you are ordering something that has to be kept cool or frozen, it will ship UPS overnight, which can take 1-2 business days, and shipping is always $19.95. Visit the Shop Now link, or any link that takes you to our online shopping portal. 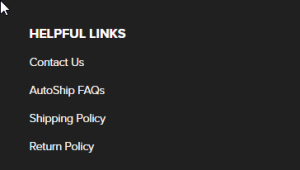 Scroll to the bottom of the page and click “Shipping Policy” for up-to-date information. It’s really easy and really fast to sign up with our new mobile app! Note: There is only ONE really really important thing to remember when signing up. Regardless of what email you use on your phone, you need to sign up with the Pet Desk app using the email we have on file for you at the clinic. If you use any other email address, we won’t be able to synchronize your patient data. 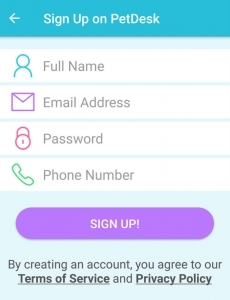 The pet desk app is tied to OUR database, not your phone, so whatever email we have is the one you need to use when you sign up! You can sign up using the link on the home page, or simply click this link to sign up. In just a few moments, you will receive an email and a SMS message from our Pet Desk server with a link to install the app on your device. You can use either method to install the app. The app looks similar to the image below. Step 4: Launch the app and create a Pet Desk account. 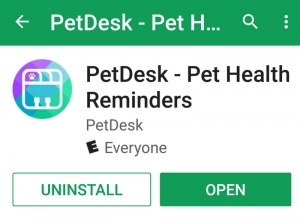 You will need to create an account with PetDesk. It only takes a few seconds and there’s absolutely no spam, no advertising, and we don’t even have access to your information. Please be sure you use the email address you have on file with Bear Creek if you want to be able to sync your pets records with our client record for you. As soon as you’ve made your account, you can login to the app and see your pet records, make appointment, and lots of other cool stuff! 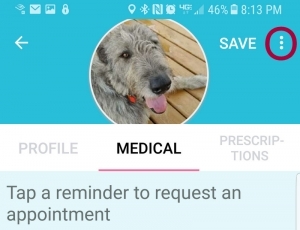 Mobile App: How to send your pet’s vaccination record all by yourself! There are times when it’s important to be able to know right off the top of your head what vaccinations your pet has had. 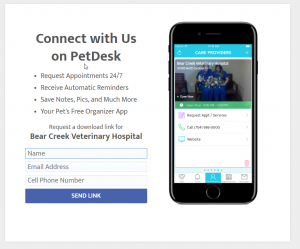 Thanks to our mobile app, any patient of Bear Creek can look up and even email their pet’s medical record in just a few clicks! We’ll walk you through it step by step below. Open Pet Desk on your mobile device. Select your pet by clicking on their photo. Click the “More” icon (the three dots on android). 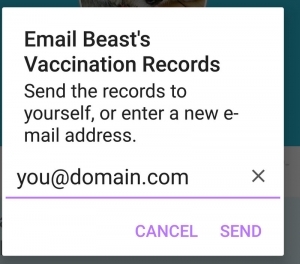 Choose the option to email vaccination records. Type the email address you want to sent the medical record to. Your email will probably be shown, so you can just press send if you want to send the record to yourself. This image below is a screenshot of what your record will look like. It will include your pet’s name, breed info, age, weight at time of last examination, rabies tag number, microchip number (if any), as well as a list of their vaccines! What are your office hours? When are you open? Our hospital facility is currently open Monday thru Friday from 7:30am to 8pm and Saturdays from 8am to 2pm. Our field service (large animal farm calls and small animal house calls) sees appointments Monday thru Friday 8am-4:30pm. Daytime and after-hours emergency fees apply to clients that want their animals seen without an appointment or after regular business hours (We are not a walk-in clinic). We do not see field calls on a non-emergency basis on the weekends. Remember we are available for “after-hour” emergencies outside these times. New Years Day, Memorial Day, Independence Day, Labor Day, Thanksgiving Day, Christmas Eve (after 2pm) and New Years Eve (after 2pm). Do you Board or Groom? Unfortunately not at this time. We do not have sufficient space in our hospital to allow for excess kennels. We need all of our available space for sick or surgery patients as they are our priority. 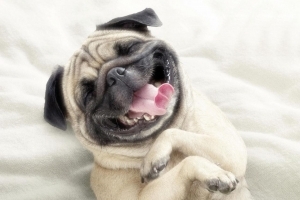 We can provide you with referral options for grooming and boarding kennels upon request. 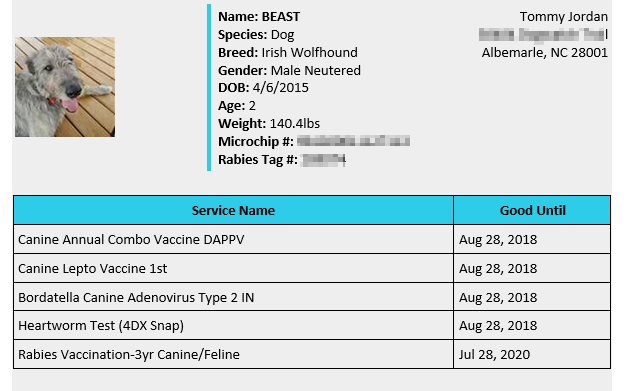 What vaccinations are required for my animal? All animals have different needs, however, ALL dogs, cats and ferrets are required by NC Law to be vaccinated for rabies. Livestock are not required to be vaccinated except under certain circumstances, but all horses and pet livestock (not chickens) are strongly recommended to be vaccinated every year with an approved vaccine by a licensed veterinarian. NC law allows for a 3 year tag to be issued to dogs and cats if certain criteria is met otherwise the vaccine is only considered current for 1 year. Stanly County (and most all counties) require the rabies tag to be worn by dogs and cats at all times. Other recommended vaccines are based on the species and risk level associated with your environment. Please email or call to ask our staff what your animal may need for your individual situation. Can you euthanize my pet at home? Yes, we can. This is a service that we have been offering to our clients since 2006. Lets face it, this is a hard time for owners and pets of all varieties. It is never an easy or pleasant decision, but one that is made in the best interest and unselfish love of a valued member of our four-legged family. Sometimes it is difficult or impossible to move the animal without causing undue pain. Also it is just made easier by having the animal in familiar surroundings, surrounded by loved ones. We can come to your home,livingroon, backyard, basement, or even your favorite shade tree. Our intent is to alleviate suffering and ease the animal over the rainbow bridge and make the good-bye process as low stress as it can be made. We can even arrange for our cremation service with Good Shepherd to come and pick the animal up at home if you choose to have them cremated. Yes, even horses. Our friendly and understanding staff members are available to answer your questions and help make the necessary arrangements. Just give us a call. Do you bill? Can I pay later? Unfortunately, the answer is no. Our practice policy is that payment is due when services are rendered. We do however, accept Visa, Mastercard, Discover and Care Credit along with cash or checks. We do not accept Blue Bird checks or American Express. Some long standing hospitalizations will necessitate a deposit be left at the beginning and then paid in full when the animal is picked up. You can email us at vet@bearcreekvet.net, but by far the most effective way to schedule an appointment is to call our office (704-986-000) and speak to one of our receptionist staff members. They are more than happy to answer your questions and find the earliest and most convenient time available to get you seen. Understand that emergencies take priority and sometimes an appointment may need to change to accommodate a very sick patient. We thank you for your understanding in this matter. Day or night, in the event of an emergency, you may reach us at 704-986-0000. If it is after-hours, you will be prompted by the voice mail to choose between an non-urgent question that will be returned the next business day (#1) or to be directed to the doctor on call for an urgent call back (#2). When you press #2, you will be asked if you have a small animal emergency (dogs and cats) or a large animal emergency (everything else essentially- horses, cows, sheep, goats, llamas, alpacas, pet pigs and backyard poultry), that way the appropriate doctor is there to respond to your problem. The voice prompt will also remind all small animal callers that we currently do not see emergencies for those that are not our patients. Once that is done, the call is diverted to the cell phone of the doctor on call. You may need to leave a message for them as they could be working with an emergency or on the phone, but be patient with them, they will call you back as soon as possible. If you are not a client with Bear Creek Veterinary Hospital, we will direct you to follow your regular veterinarians after hour plan. They will either be able to attend you themselves or they have a referral hospital to which they will send you. There are two main emergency hospital commonly used. If you do not have a regular veterinarian, you may call one of these as well. Can you come to my home for an appointment? Farm or house calls are scheduled the same as in-clinic appointments. The doctor is given a time to be at your home or farm on a specific day. We arrive with our mobile unit (the Truck) hopefully fully stocked with the anticipated needs for your appointment. It is important that you be as specific as you can when scheduling the appointment of your needs so that the doctor can be as prepared as possible when they arrive. We all hate to arrive at our destination and realize that we do not have what we need. Some things cannot be performed in the field and must be scheduled in the clinic (aka most surgeries). Our doctors have laptops complete with all the records as the main facility and a printer in the truck for quick and professional invoice printing. We can even swipe your credit card in the field for easy and convenient payment processing. Sorry we don’t take American Express.